Lowdown: Friends recover from an eventful stag party they remember nothing of. Bachelor parties are a mini genre by their own rights. The first I recall is an 18+ one with a young Tom Hanks, Bachelor Party, that I got to see at the cinema despite being severely underage; these are the advantages of being tall and of cinemas wanting to make as much money as they can. If anything, films belonging to this genre prove that you can make a decent film without having any significant artistic claims. The Hangover provides further evidence to support this claim. 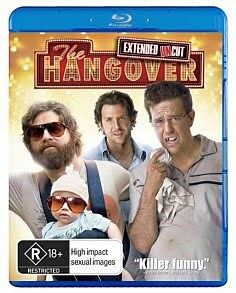 The Hangover doesn’t start in realms that haven’t been explored before, it just takes these realms to new extremes. A group of Californian male friends drive off to Vegas a few days prior to one of them getting marries in order to conduct the ritual known as the stag party. The group includes the would be groom, two of his friends (each accompanied with their own set of faulty backgrounds), and the would be groom’s would be brother in law (a rather eccentric fellow). They hit Vegas, they have their first drink of the night… and the next thing we know it's morning time and they’re awake in their stupidly expensive hotel room: the room has been destroyed, a human baby is in one of the storage cabinets, a very live tiger is in the toilets, and the would be groom is missing in action. Henceforth starts a search and rescue operation where the friends find more and more about what happened during the previous night, a night about which they remember nothing, all in the just cause of locating their friend so he can have his wedding. It’s all pretty extreme stuff, as one can expect given the tiger and the baby, and it all combines everything one is normally led to expect about Las Vegas. It’s funny, even though a lot of it is not a straight out comedy but more like an extremely active drama; and it’s not shy of crossing the line into realms the politically correct amongst us would find in the wrong. For the record, the Blu-ray features the cinematic version as well as a less refined extended edition; we went for the latter, of course. For what is a good comedy I was surprised to say that although some of the faces were familiar, the only truly familiar face (and body) was that of Heather Graham, who plays a rather minor role. Best scene: There’s a whole lot of craziness here, but I was really taken by surprise when Mike Tyson showed up. Technical assessment: A nice Blu-ray. Not outstanding but not bad either. Overall: Crazily funny. No higher message here, just a fine attempt at outdoing all crazy stag party films done before. 3 out of 5 stars.